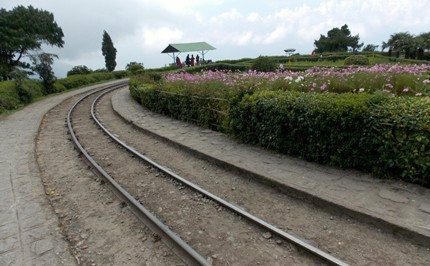 If you are taking a toy train ride from Darjeeling, you will pass by this magnificent loop. Otherwise, take a cab from Darjeeling town and visit the Batasia Loop. It's located on Hill Cart Road (i.e. National Highway 55) and takes 20 minutes by taxi from Darjeeling town. There is no better place to get a 360 degree view of Darjeeling's landscape including the hill town and the snow covered peaks of the Eastern Himalayas with the majestic Kanchenjunga on one side. And all this from the middle of a lovely flowering garden around which the toy train track is laid. Batasia means airy space. the As you stand on one side of the garden and see the toy train making a complete loop while hooting its whistle along the way and trying to negotiate the spiral track with a double loop, it's a fabulous experience. There are seating areas as well to enjoy the views. The entire area along with the gardens and an approach bridge that leads to the garden is about 50,000 square feet. It has been covered with grass and beautified with both seasonal and perennial flowers and shrubs. Batasia Loop was commissioned in 1919 because it was an engineering requirement for the toy train to be able to handle a steep gradient. Just after Ghoom (which is the highest railway station) there is a sharp fall as the toy train moves towards Darjeeling. There was no way the toy train could negotiate such a drastic fall of about 140ft unless there was a way to somehow reduce the gradient of the slope. Batasia Loop was created by the British to counter such sharp descent. You won't even realize how the toy train actually descends by about 140ft as it completes the loop through a large circular area and on a gentle slope and then crosses its own track near the beginning of the loop through a tunnel below. It is considered as one of the greatest engineering feats. You can walk along the track and complete the loop yourself. I do it every time I am there. Or take the many pathways in the garden and walk around, enjoy the many flowers and the surroundings. There is also an Eco Garden in Batasia. It provides a lot of information about organic farming and plantations in Darjeeling. Here you will find many rare species of plants like the Gingko biloba. And there are Rhododendrons, Silver Firs and even tea plants. At the center of the Batasia Loop is the War Memorial. 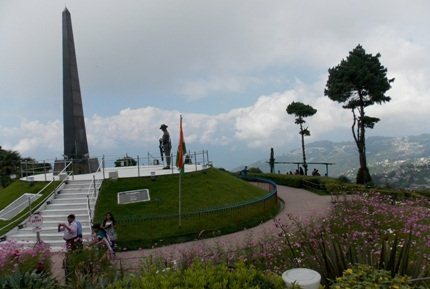 This was opened in 1995 to commemorate the Gorkha soldiers of the Darjeeling Hills who sacrificed their lives in various wars after India's independence. At an elevated platform there is a Cenotaph and a statue of a soldier paying homage. You will need to take the same walkway back for the exit. As you come out, you will see a small market area. If you arrive early in the morning, right outside there are temporary stands put up where the locals sell snack items like the hot samosas or singaras (fried vegetable stuffed pastries). The market is a good place for buying curios, bags, hats, and other decorative items. There are shops on the opposite side of the road as well selling cups, flasks etc. But watch out for the price. On the opposite side of the road and little further down there are few nice restaurants with great views of the mountain range. In fact you will get almost the same views of the peaks and landscape from there as from the Batasia loop. So if you plan to take breakfast or even lunch here, you have a nice option. They serve North & South Indian dishes here and additionally Chinese items during lunch. Most importantly, there are washrooms and toilets. I have used the one upstairs at the 2-storied restaurant, it was quite okay. There is a fun way to enjoy the loop. You can take a joy ride on a Toy Train from Darjeeling to Ghoom that leaves Darjeeling station several times a day (usually four times during high season). It stops in Batasia Loop for few minutes. There is a small train shade on one side where the trains stops. You can both enjoy the views standing on the garden and also the ride along the loop if you take the train. For the joy ride, check out Toy Train Rides & Services for details and know how to book the ride. Daily 5am to 8pm. There is an entry fee of Rs. 15/- per person. There are pay & use toilets for ladies and gents located inside at one end. 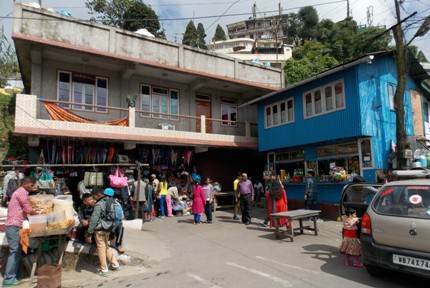 It's 5km (3.1 miles) from Darjeeling Town and located just below Ghum station. If you take a car or a taxi, it takes around 15 minutes from Darjeeling town to reach the Batasia Loop (along Hill Cart Road). The taxi will drop you or wait below at the parking by the roadside. You need to walk up to the ticket counter, purchase entry tickets and then enter into the loop. Can I go to batasia loop by car instead of toy train ...? if I go by car will I be able to go that point where the toy train halts for 10 min. for taking pictures and enjoying the scenic beauty. Yes you can go by car... park your car at the parking at the road level, walk up to the ticket counter to purchase entry ticket and then enter into the loop premises. Hi Raj, I must appreciate for your splendid reviews. I am a frequent traveler but hardly I can find such types of dedicated reviews. If you can clarify my below questions, that would be great. 1. Suppose if I book 2nd class train ticket from Darjeeling to Ghoom, then how do I reach to Batasia loop from Ghoom station. Is it a walking distance? 2. Do you any difference between Joyride train & 2nd class train to reach Batasia/Ghoom? Hi, all toy trains from Darjeeling to Ghum pass through Batasia, however the Joyrides stop at Batasia for few minutes, other trains won't. You can walk back to Batasia from Ghum. The route up to Ghum is same for all toy trains, in fact there is only a single narrow gauge track all the way from Darjeeling to NJP. The the route is the same for return. The difference between Joyride and other trains is mainly that several runs of the joyrides are hauled by heritage steam engine while the other trains run on diesel engine. Several regular toytrains trains also have First Class coaches other than 2nd class.